​​Racing Goldmine is a newly launched horse racing tipster service from the BetKudos arm of the wider Betfan group. The selections actually come courtesy of tipster Richard Man. Supposedly “HORSE RACING DYNAMITE”, BetKudos says that this service will allow for some “Brutal Bookie Bashing Working Alongside A Genius”. ​Of course this kind of claim is commonplace for products from Betfan and oftentimes, when you start to peel everything back you have to invest a lot in order to get close to the published results. With Racing Goldmine however, this doesn’t seem to be the case at all and as such, I am rather excited by what I have seen. In a lot of respects, Racing Goldmine breaks the mould for the majority tipsters and I don’t think that this is necessarily a bad thing. First of all, selections are issued the night before a race rather than on the day. This is something that is generally critical in ensuring that you get the best possible prices and in turn, the best value. Richard Man’s selections for Racing Goldmine are sent out via email as well as being uploaded to a member’s area on the BetKudos website. In terms of the types of bets, it is actually straight forward with all selections to be backed to win. This is about all that is simple however. The volume of selections that you are backing on a given day is typically very high. 1 ​What is R​acing Goldmine? 2 ​How does ​Racing Goldmine work? 2.2 ​How Much Does Racing Goldmine Cost? 2.3 ​What Profits are Being Made on Racing Goldmine? 2.5 ​Where to Purchase Racing Goldmine? A quick look at the proofing for Racing Goldmine reveals 16 selections on a given day whilst actively looking for a busier day shows as many as 30. This doesn’t however mean betting on this many races as I will explore. One of the things that really stands out about Racing Goldmine for me is that given that this is ultimately a Betfan product, the staking plan is comparatively reasonable. All bets that are placed are advised to just a single point. I have to hold my hands up however and say that you are still betting multiple points per race, however these are spread out. This only really leaves the strike rate to consider in terms of the numbers with Racing Goldmine. BetKudos have been proofing Richard Man’s tips since April 2017. At the time of writing, this means a little over 6 months and during this time it has attained a strike rate of 31.19%. This is a decent figure and I am particularly impressed with this given the odds of the horses that Racing Goldmine recommends you back. 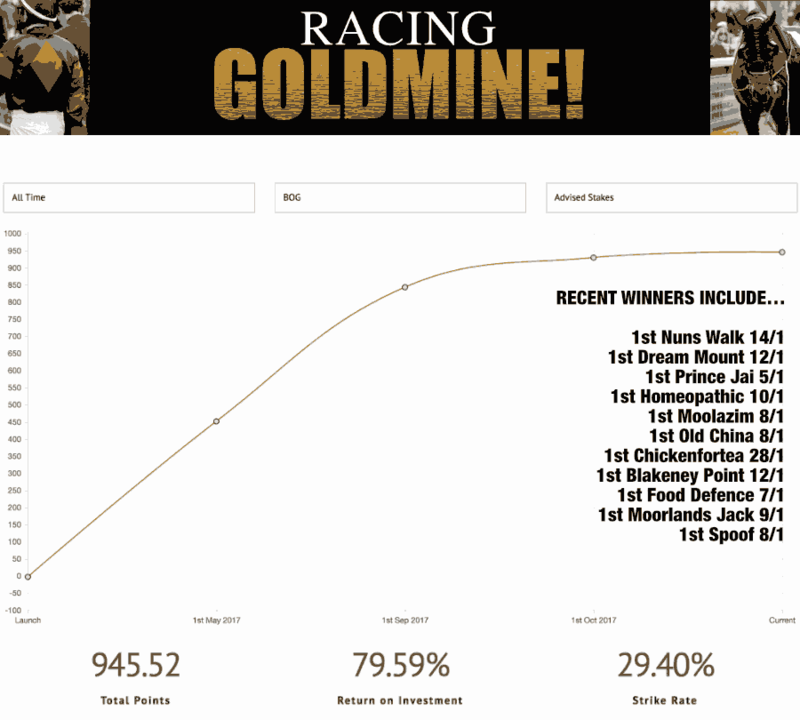 ​How does ​Racing Goldmine work? There isn’t a whole lot of information made available about how Racing Goldmine works which is a bit of a shame, however I do have some ideas. Key to this is the fact that Richard Man tips multiple horses per race, and these have a tendency to have longer odds. My theory is that instead of looking for races where there is a strong favourite, he looks for races where the favourite is perhaps weaker. Once you have narrowed this down you could easily start to see which races have horses with long odds which actually have a fair chance of winning. I should point out that this is entirely speculative on my behalf and truth be told, I would have liked to see at least some information in this regard. Whilst I would never expect BetKudos to publish the methods that are behind Racing Goldmine, I do feel like some insight should be offered, if only so consumers can make an informed decision about what they are buying into. ​How Much Does Racing Goldmine Cost? 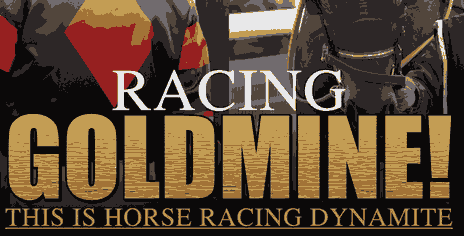 As a service, Racing Goldmine has performed particularly well as we will explore. Combine this with the fact that Betfan have a tendency to put a premium on their services and you don’t need me to tell you that it won’t be cheap. In fact, BetKudos are asking £57 (plus VAT) for a 28 day subscription to Racing Goldmine whilst a 90 day membership will cost you £114 (plus VAT). It is also worth pointing out that as Racing Goldmine is a Betfan product, there is no real money back guarantee in place either. The team do however say that they will review any requests for refunds and if they feel it is justified, they may offer this. I wouldn’t however pay for Richard Man’s selections with the intent of getting your money back if the service isn’t for you. ​What Profits are Being Made on Racing Goldmine? ​​Since proofing began in April, Racing Goldmine has gone on to generate an incredible 965.02 points of profit to BOG. This figure is impressive enough, especially given the fact tat this is to 1 point stakes. Combine this with a very strong ROI of 89.02% and you are onto a winner. What really stands out about this however is the profits to BSP. Here, Racing Goldmine has made an astounding 1164.18 points of profit and an ROI of 109.61%! Furthermore, this has been earned very consistently with no losing months to date. It is hard not to be impressed with what Richard Man has achieved in Racing Goldmine, and it is difficult to argue with BetKudos when they suggest that this might be one of the best tipster services on the market. If there was one concern that I do have with Racing Goldmine, it is that by betting to BOG all the time, you may well find your bookies accounts being compromised however the BSP profits actually dwarf bookies prices. If I have one criticism about Racing Goldmine it is that the volume of bets is vey high. Whilst the recommended 200 point betting bank should be enough to absorb losses, I can see a few unlucky days having a big impact in the shorter term. Truth be told however, there isn’t a whole lot of evidence to suggest that this will happen. The strike rate is solid and the 6 months of proofing are more than adequate as far as I am concerned. It is not often that I get to enthuse about a tipster service like this but Racing Goldmine is definitely one worth following. It is expensive, yes, but sometimes you really do get what you pay for. As far as I am concerned, 6 months is long enough to show that this is a winner. Even the cynical voice in me that always pipes up when looking at Betfan (a number of their products have a nasty habit of bombing post launch) can’t find a lot to argue about. If you do have reservations, I would give this a month, just to make sure that Richard Man can keep his system going. Otherwise, whatever magic is being woven behind Racing Goldmine is clearly winning. I cannot think of a service this impressive for some time and as such, I would strongly recommend giving this one a look over for yourself. ​Where to Purchase Racing Goldmine? Racing Goldmine is from Bet Kudos, which is an established tipping outfit, who offer money back guarantees on their services, so there are no worries there. Not a great deal of information on their website about this service, but there never really is with Bet Kudos.